The "Gateway to European Vision Research" is a web-based portal service for the European vision research community and major stakeholders. Why does the European Vision Research community need it? The development of such an instrument fulfills the need to give this community sharper visibility, a consolidated profile and at the same time underlines the importance of its work in science and in society. Further this web-based portal will stimulate the communication between basic researchers, clinicians, politicians, patient organisations and industry. At the same time it combats the community's fragmentation and increases the transparency of its activities. For whom does the portal work? For you! And also for a lot of other people involved in vision research. You do not need to be a member of EVI EEIG to have free access to the portal and to profit from the offered features. If you have any request or you want to present your research group, your institution and your projects, please contact us. The same applies, if you are working in the industry or if you are involved in a patient organisation or in a ophthalmological organisation. 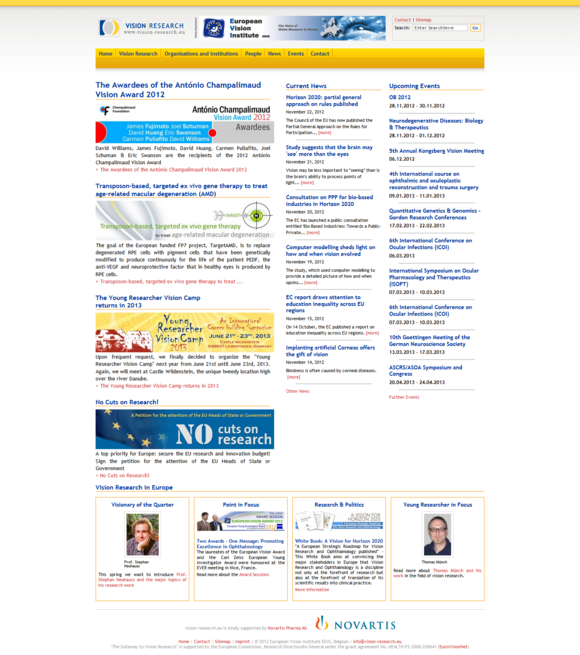 The European Union, supported the idea of the vision-research.eu portal as a essential part of the EuroVisionNet project and offered the European vision research community a unique opportunity to increase its acceptance and its visibility, to consolidate its profile and to win recognition in the scientific community and in society generally.